Info: Tinker Hatfield continued to revolutionize the shoe game with the Air Jordan 5, as it was the first to boast a clear rubber sole and lacelocks. This special Bin23 edition was inspired by long time Jordan head Alex Meacham’s love and experience with black shoes and white laces. 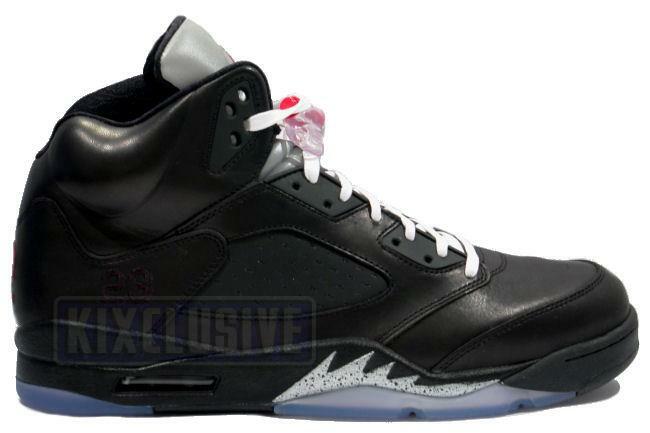 Other features include a metallic silver tongue, and icy sole, a red lacelock and a red Jumpman logo on the outsole. Only 2133 pairs were made and each pair is individually numbered on the tongue. February 2011 extremely limited release.